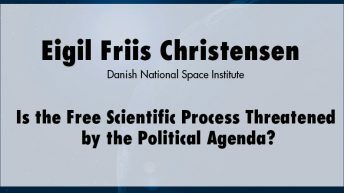 Eigil Friis-Christensen, Ph.D. has served as director of the National Space Institute since 1997. In 2007 the institute became part of the Technical University of Denmark. He has served in various capacities at the Danish Meteorological Institute, at the Niels Bohr Institute of the University of Copenhagen, and at the European Space Agency. He is the author or co-author of more than 140 research papers and has presented more than 50 invited papers at international conferences. He has been invited as a visiting scientist at several major research institutions and universities in the United States and Russia. He has been international liaison in the Steering Committee of the Geospace Environment Modelling program, part of the U.S. National Science Foundation’s Global Change Program. In 2007 he was elected president of the International Association of Geomagnetism and Aeronomy and in 2008 he was appointed member of the European Space Science Committee of the European Science Foundation. In 2008 he was elected member of the Royal Swedish Academy and in 2009 he was elected fellow of the American Geophysical Union.